Sustrans Scotland are taking part in Clean Air Day in Edinburgh on 21 June as part of a push to encourage people to walk and cycle more for their everyday journeys. To mark Clean Air Day, Sustrans Scotland are inviting members of the public to share their views on the current conditions and issues along the streets and the types of improvements they would like to see, as part of a new “Meadows to George Street: Streets for People” project. This initial engagement from the public in the project forms part of a series of events and activities over the summer which will gather the views of anyone who uses the route or who has an interest in it. People are invited to visit the project webpage to sign up for updates and share their views via the online Placecheck tool. “Meadows to George Street: Streets for People” is funded by the Scottish Government through Sustrans Scotland’s “Community Links PLUS design competition“. It aims to transform this busy transport route in the heart of historic Edinburgh by significantly enhancing the quality of walking, cycling and public spaces. The project will extend along Hanover Street, The Mound, George IV Bridge, Forrest Road, Bristo Place and Teviot Place. 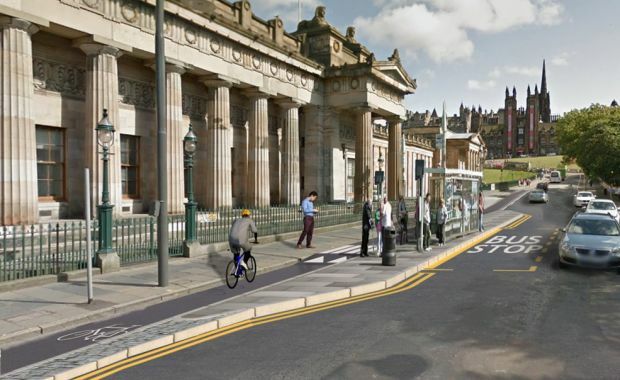 “The ‘Meadows to George Street’ project will vastly improve the experience for people walking and cycling in Edinburgh and help create safe, coherent and attractive routes through the city centre. As part of a City Summit to mark the International Clean Air Day, City of Edinburgh Council will hold a series of events, including closing one of Edinburgh’s central streets to cars and having a procession led by Scotland’s Transport Minister, Humza Yousaf.